Langshans often surprise first-time owners. For a large fowl they prove quite active. Fortunately, Langshans also possess a docile, calm, and friendly disposition. They tame easily and live long. Langsshans make a good family pet. The adaptable Langshan takes to foraging or confinement with equal ease. Langshan hens brood more than some like; however, they also make good brooders for other breeds and good mothers to their own. Langshan roosters can stand twenty-four inches to thirty-two inches tall. They rank as one of the tallest and lightest, non-game Asiatic breed in the world. Their tall, regal deportment translates well in the show ring. Langshans also have a sixteen inch tail. 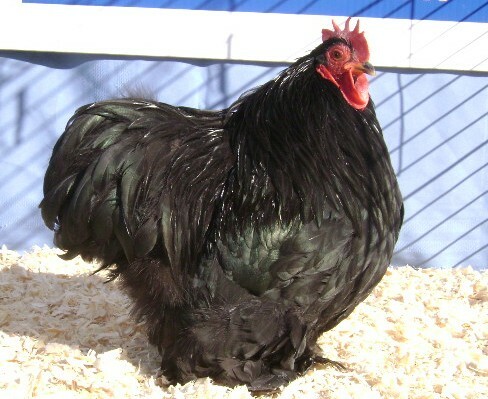 The American Poultry Association recognizes three varieties of Langshan chickens: Black, White, and Blue. Black Langshan, the most common configuration, has black feathers with a green sheen. They stand on black feathered, bluish-gray legs and feet. Their medium-sized, bright red combs, wattles, and earlobes stand out against their very black plumage. Change the black feathers to white, and you get the White Langshan. The very rare Blue Langshan comes from crossing the Black and White Langshans. Langshans can survive about any climate. However, production and appearance can suffer in extreme conditions. For best results keep them warm, dry, and clean. They need food ad libitum during their skeletal development. Provide good layer food for the hens. Enclose the run with six or seven feet fencing or clip their wings to prevent flight. They tolerate confinement but as an active breed will appreciate room to forage. Langshans suffer less than other breeds with their feet; however, keep an eye out for mud balls between the toes.